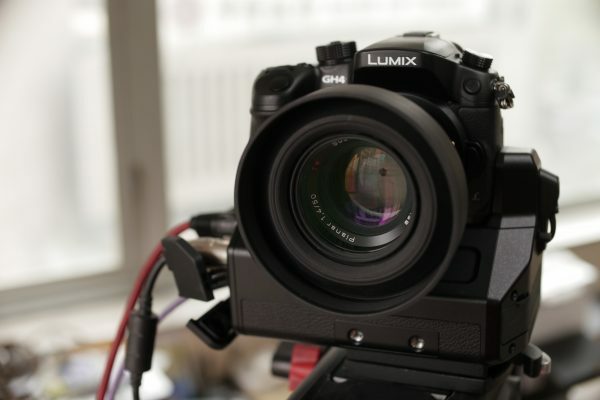 The Panasonic GH2 was genius. I loved the little camera; amazing video quality, great gamma options, superbly positioned controls, neat fit in your hand. The Micro four thirds sensor perfect for news with access to shallow or deep depth as required from a super compact camera body and lenses. I shot outstanding stories with this little gem. 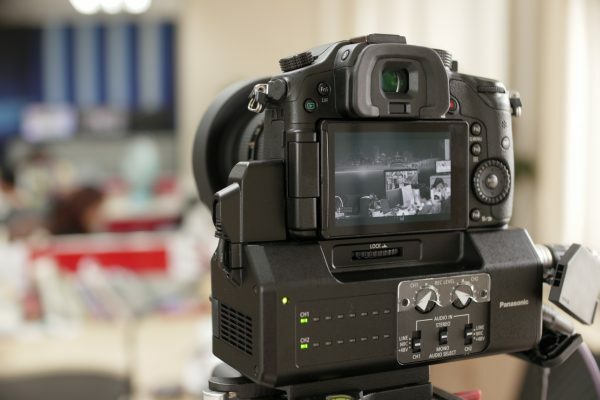 The GH3 was ghastly; unusable viewfinder, awful video with jittering and stair-stepping. Hard to use controls and layout. I tested it through prototype to production, but didn’t buy it. Now with the GH4 the goodness is back. It shares the GH3 zero body styling and slightly tricky controls, but everything else in the GH4 has massively improved. Without doubt the video quality is exceptional. The EVF is clear and sharp (monochrome if desired) without the edge smear that marred the GH3. Manual focus peaking works well with different colours and levels available. Selectable zebra at percentages you choose. Synchro scan shutter adjustment eliminates flicker shooting computer screens. Timecode has familiar options to my broadcast camera. There is a huge range of Gamma mode and curve settings, codec choices up to 4K and a terrific Lumix menu. I confess I lost heart with the GH3 and feared that video from hybrid stills cameras was history. The GH4 has restored my faith. I’ve taken the prototype from firmware 0.4 to 1.0 and am now confident this camera is for me and you get an insanely capable camera for your money. My style is not to build these cameras into monsters. I’m not interested in cymbals, gimbals, or bolt on brackets with external batteries. The GH4 and a Gorillapod used as a brace will give discreet low profile shooting. I haven’t fine tuned my settings and most of my testing has been done in ‘natural’ mode. I liked the way it looked and it gave room for the limited grading I use in news. The handling of highlights from the GH4 is much improved and images benefit from the increased dynamic range. Correct exposure gives gorgeous results. Mainly my testing has been workflow related and I’m pleased it is working out well. Of course nothing is perfect, GH4 video quality is as good as I’ve seen from a sensor with rolling shutter, with limited jello or warping of images visible on fast pans. This negative effect is reduced further in HD when shooting 50fps for broadcast. I do wish there were two SD card slots. GH4 controls could be better. The rear menu thumbwheel in particular remains a fraction too small for me. 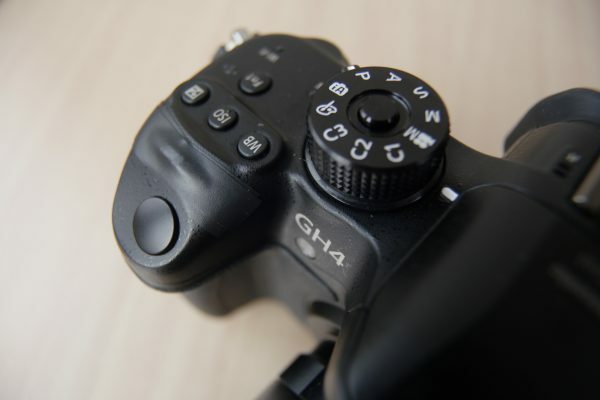 There is a lock on the GH4 mode dial, though I can’t remember accidental mode changes on the GH2. More useful would be a shutter dial lock. I adjust shutter with the top wheel and aperture with the back wheel. The top wheel is easy to accidentally rotate and change shutter speed in error. I solved this with some plastic tape. A shutter lock would be more elegant. The GH4 has an electronic stepped aperture which simply isn’t acceptable for video. A video orientated camera needs step-less cine style aperture control. I wish all new Lumix lenses had an aperture ring with step-less option. I also want Panny or Leica to make a constant aperture 14-55mm f2.8 Micro Four Thirds (MFT) zoom lens with built-in image stabiliser. I currently use an adapted Leica 14-50mm Four Thirds Lens which covers that really useful range and has an aperture ring. Not quite as wide as the Canon 24-105mm on a full frame DSLR, but wide enough and I don’t get totally caught out if I need to punch in on the longer end of the lens. For hand held video work lens stabilisation is essential. Hand holding a camera this small gives micro jitters even from the blood pulsing through your hands. I wish the GH4 had used the Olympus five way sensor stabilization system, which could operate with any lens. Olympus are also making some Pro level MFT lenses with a broader zoom range and apparently superior build quality – but still no aperture ring. The GH4 ETC crop mode (digital doubler) is markedly sharper than on previous sensors. Now it is a usable tool I just wish we could activate this whilst recording as with the Olympus EM1. Like the GH3, when using non-Lumix lenses with the GH4, you have to shift your grip and move your thumb down to the function button to magnify for manual focus. This is a tricky manoeuvre and inferior to the GH2 which did everything with one dial, push in to magnify without moving your thumb or changing the grip on the camera. The GH4 add-on camera top mic recorded my heavy breathing and muttering very well. I wish Panasonic made a hot shoe powered directional top mic that requires no cables to connect through the hot shoe when you switch on the camera. All third party mics and Panny top mic require a cable and battery which the operator must remember to switch on/off. GH4 audio menu is getting better, but lacks the options of a broadcast camera. For example to split Ch1 to top mic and Ch2 to external. I remember a disaster with my 5D mkII when the cable was ripped from the camera in a scrum. The jack was left in the socket and no sound was recorded at all! Thankfully the GH4 has a headphone socket for audio monitoring so this shouldn’t happen now. Built-in ND filters remains the most desirable feature not found on the GH4. If Sony can do it with the diminutive RX10 then it must be possible. Juggling lenses in a news environment is tricky enough, screwing around with ND filters would be unnecessary with built in camera ND. I was disappointed to see the twenty nine minute recording limit on my UK demo model. I’m not sure if worldwide version will be the same. My only other big wish is for higher bit-rate for the interlaced recording options. I know it isn’t fashionable, but practically it is very hard to mix the progressive GH4 footage successfully with the rest of my broadcast world, which is still very much interlace. The AG-YAGHG interface Unit or U-G-L-Y for short is probably useful in 4K production. It worked for me as a live bureau camera interface. The interface is big, expensive and requires either mains or dc via 4pin xlr. No real use for me in the field as I have neither mains power or the desire to carry large camera batteries and charger. The good news is the GH4 underbody connectors are there for future units and third party devices. What I actually need is an external battery pack sized audio control and input unit. This should be powered by an additional internal camera battery at one end with two xlr sockets at the other. Why not just use another bolt-on audio box? Currently I’m using an elderly Juicedlink external pre-amp to do the job, but I dislike relying on cables linking camera to audio mixer. It has to be said that hand holding a small camera with XLR mic cables dangling and swinging is challenging enough anyway. The other advantage to having an audio pack underneath the camera body is that the heal of your palm can rest against it giving much improved hand held stability. I have barely mention 4K in this write-up but I am extremely interested in exploring the possibility of shooting 4K to the internal SD card and converting to HD in the edit. I can see this being particularly useful for feature news stories where deadlines allow for longer time in post-production. The potential of much improved video quality and the opportunity for cropping and reframing is very tempting. Powerful editing and fast memory cards will definitely be required. I see being able to record 4K to the GH4’s internal SD card as a major advantage as I am not looking for external recorders. 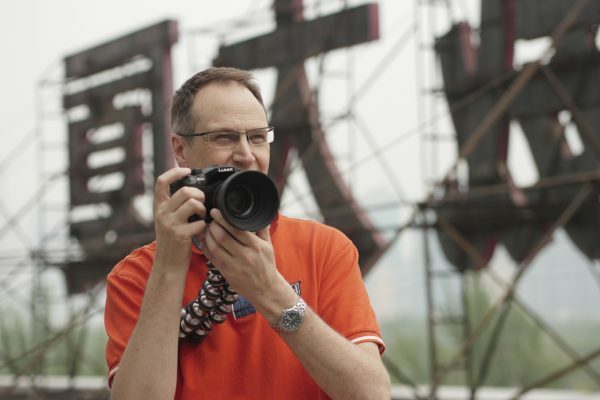 Andy Portch is a Senior cameraman for Sky News based in Beijing. Recent Polk award winner, Emmy and RTS nominated. Stories shot by Andy have won awards from the RTS, Press Association, Wild Screen and MonteCarlo Film Festival.